Marshall needs to be good. The Sherrif too. Good morning soccer hooligans and Rave Green faithful! This is the day! This is the day I get to go to the RIOT (Rio Tinto Stadium) and be the obnoxious visiting team supporter. This is the day I get to take off my journalistic hat and objective analyst garb and just be green and blue forever! Can you tell I am excited? In case you haven’t gotten the message, I will be in attendance tonight for the RSL vs. Seattle match. I will be the one person wearing green in section 37 (east side, just off midfield, 30 rows up; great seats–thanks Cliff and Kevin). My name is Rich Michelson, Sounders Soccer Editor at Seattle Side Up, and I will be your guide to this matchup of the Claret and Cobalt vs. the Rave Green. Also don’t forget to check out the awesome linkage at the bottom of this post! Cool links like this one showing MLS salaries visually await! Javier Morales is the attacking midfielder. With similar to Clint Dempsey, he can dribble, pass, and finish. When RSL has set pieces watch out for Morales’ sniper-like accuracy. At this point he is not showing his 35 years. His weakness? He is not a good defender, nor an aerial threat. Luke Mulholland, a midfielder an unheralded acquisition for RSL last year. Then he stepped on the field and won a starting spot over player of the future, Luis Gil. He has not given it up. Mulholland is a second box to box destroyer for RSL, teaming up with USMNT Kyle Beckerman. What is remarkable is that Mulholland is naturally an attacking center midfielder. Keep an eye on Mr. Mulholland. He is sneaky good. Nelson Valdes is the key player for Seattle today. With RSL’s defense focusing on Obafemi “The Goal Machine” Martins, Valdez should have plenty of one-on-one opportunities to punish RSL. With center defender Jamison Olave questionable for this match, Valdez should be able to find space to either find his own shot or create for others. Expect Valdez to get an assist to one of the midfielders in this one. Seattle newcomers key victory. Friberg, Valdez, and Evans get assists to Martins, Valdez, and Rose. Torres, Marshall, Mears, Evans lead the defense and bottle up the Salt Lake attack. 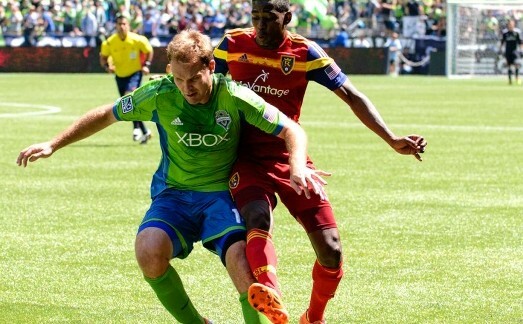 RSL 0 – 3 Seattle. Salt Lake City was awarded a MLS expansion franchise in 2004 over Seattle. In the intervening years, Seattle soccer culture expanded and grew organically, and many supporters organizations and clubs were formed in those late USL years; most notably the Emerald City Supporters in 2005. As a result of being denied a franchise in 2004, Seattle Sounders USL owner Adrian Hanauer was forced to look for fellow partners to help him cover the costs of the MLS franchise fees. He found Joe Roth, Drew Carrey, and Paul Allen to partner with him. This probably lead to the formation of the powerhouse MLS franchise it is today. So thank you RSL for screwing over Seattle Sounders FC and the Puget Sound and starting a rivalry. In first years after being formed, RSL really struggled. But in 2008 RSL, following the appointment of former head coach, Jason Kreis*, made the playoffs for the first time and advanced before being knocked out. The next year, RSL won MLS Cup in a dramatic shootout victory over the hated LA Galaxy at Quest (now Centurylink) Field. This victory is RSL’s first and only trophy. While the club has won many many games and become a model franchise in MLS. It has not won any other tournament since. In 2013 the lost another penalty shootout to Sporting KC. Earlier that year they had also lost in the US Open Cup final to DC United at the RIOT. It seems this year will also be one without a trophy for RSL. They just were eliminated by their fiercest rivals, Sporting KC, in the semi-finals of this years US Open Cup (for more on the history of this rivalry read this). RSL is 9th in the very tough MLS Western Conference. This year they have struggled due to a ravaged back line. This season, the top two center backs have hardly played. This has led to too many mistakes by the rookies which have been coupled with an inconsistent offense. Now most of us don’t expect this from RSL. One possible reason is that the team hasn’t gelled in their new 4-3-3 formation. For the entirety of the Jason Kries era, he basically ran a 4-4-2 diamond that sought to dominate midfield possession, and clog the middle of pitch. play great defense and make timely runs and attacks. New head man, Jeff Cassar decided to implement a 4-3-3 to enable forwards Joao Plata (13 G 6 Assists in 2014), Designated Player Sebastian Jamie, and just traded Alvaro Saborio, to all play at the same time. That hasn’t really worked out this year. *Former RSL striker and head coach Jason Kreis, now manager of NYCFC, is the only RSL player to have his number (9) retired. He is also one of only 7 USA professional players to ever have their uniform numbers retired. No local broadcast. Time to go to your favorite futbol bar and have a few. Big changes in RSL management, Manning gone, owner=GM???? ; are they being run into the ground? Soccer is popping up everywhere. Cincinnati is set to get USL team. San Antonio pushing to join MLS, expand stadium. Richard Michelson is an avid sports fan and the Managing Soccer Editor here at Seattle Sports Union!